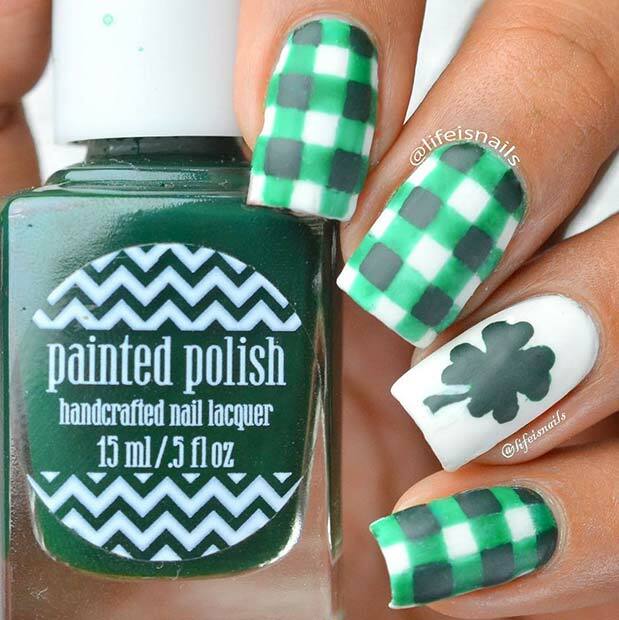 Stylish plaid nails have had a St Patrick’s day makeover! The plaid has been painted with a gorgeous green color and there is one clover accent nail. There are so many tutorials online to help you create the plaid look. It is a great technique to learn because it looks great on nails all year round. Our next design idea is super cute! The accent nail features a green clover design that is actually four hearts. You could recreate the clover design on a plain white nail or add in glitter dots like the ones featured. Hearts are also great to learn as they suit so many different occasions! 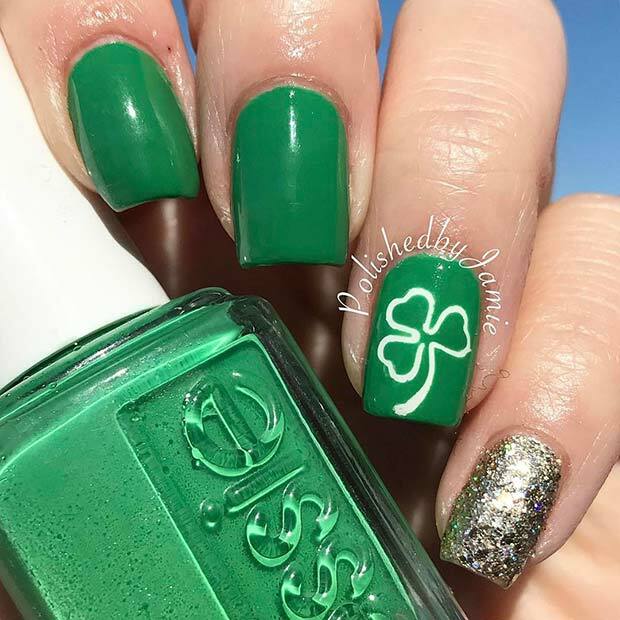 If you like the lucky Irish theme, then this next nail idea is for you. One nail has a lucky me quote and the other nails have clover designs. This design is stylish, festive and will suit everyone. You could recreate something like this on long and short nails. 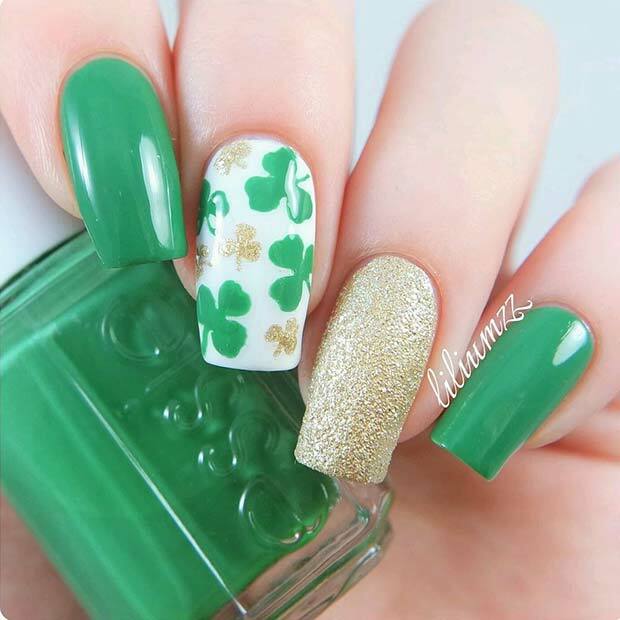 Next, we have St Patrick’s nail art that is stylish and cute. 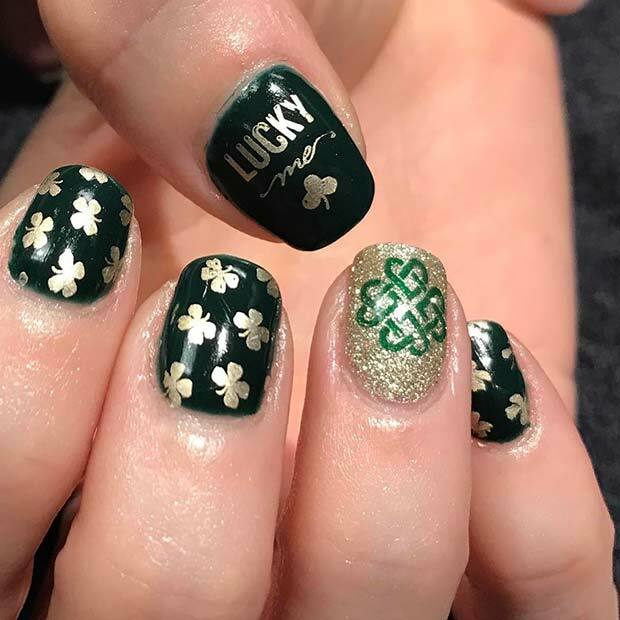 Four of the nails have a green shamrock design and one nail is glittering gold. You could recreate a similar look with a stencil or freehand. 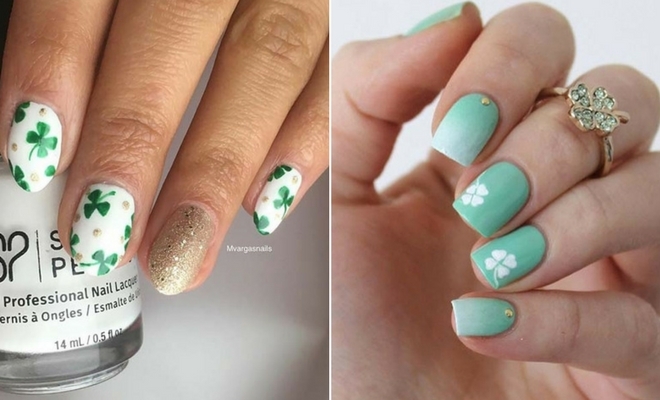 Keep the accent nail for a glam look or give all the nails the shamrock design. Leprechauns are part of Irish folklore, so it is no surprise that they inspire designs for St Patrick’s day. This manicure features an accent nail that looks like a leprechaun’s outfit, you can see the green top and belt. 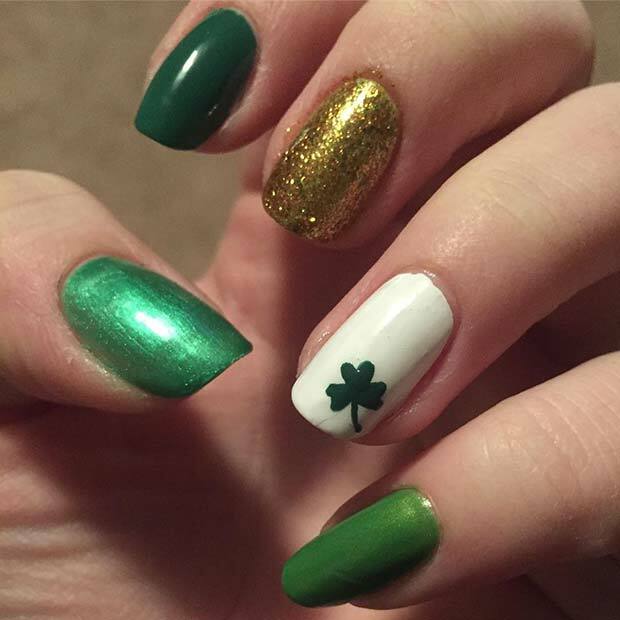 The accent nail is alongside a shamrock design and green nails. This is a fun and quirky nail art idea that will look super cool for any event. Looking for nail designs that are quite simple to do yourself? Then this next idea could be for you. The nails have been painted in different shades of green with a glitter and shamrock accent nail. You could recreate the whole look or to make it even easier just use the green and gold glitter. 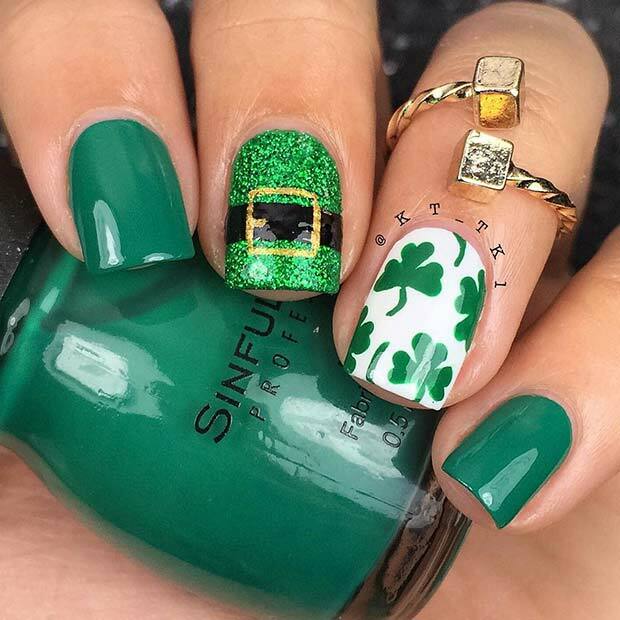 This St Patrick’s look will suit all nail lengths. You can add green to the nail designs you wear often to make them perfect for St Patrick’s day. This nail art idea features green and white stripes with shamrock accent nails. You could recreate the stripes and shamrocks or just use green stripes. The green stripes will help you celebrate the event in style. If you like your manicure to make a statement this next idea could be for you. The nails have been painted a dark green and have two accent nails. One is silver glitter and one features a white shamrock outline. Nails like this would be quite simple to recreate and will suit anyone. You could recreate these with or without the glitter accent nail. 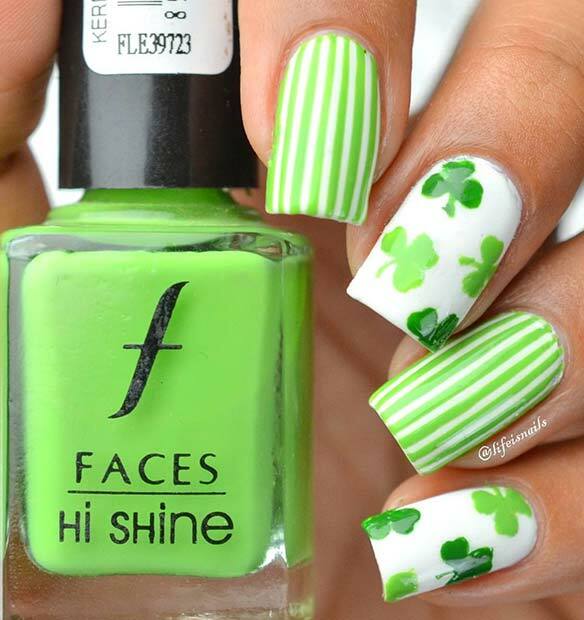 We have featured quite a few shamrock designs but our next nail art steps up the game! Instead of creating a simple green shamrock this artist has created a glamorous and glittering clover. Nail art like this will require patience and effort but the end result will be worth it! 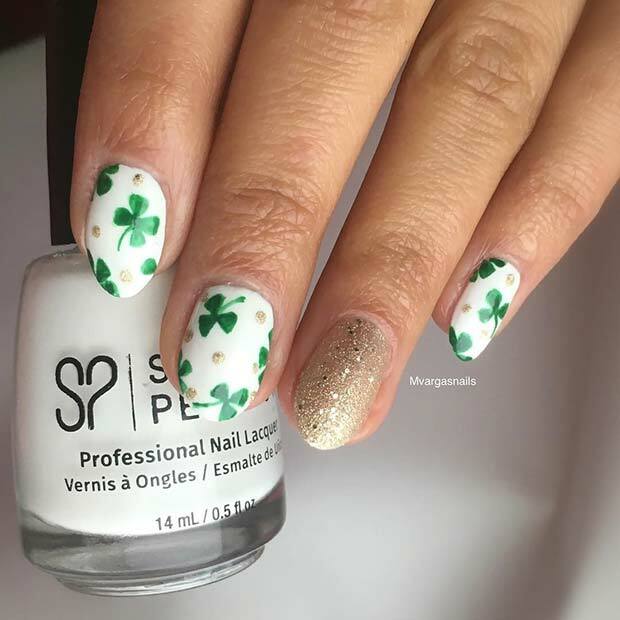 Our next St Patrick’s nail idea features a shamrock accent nail. 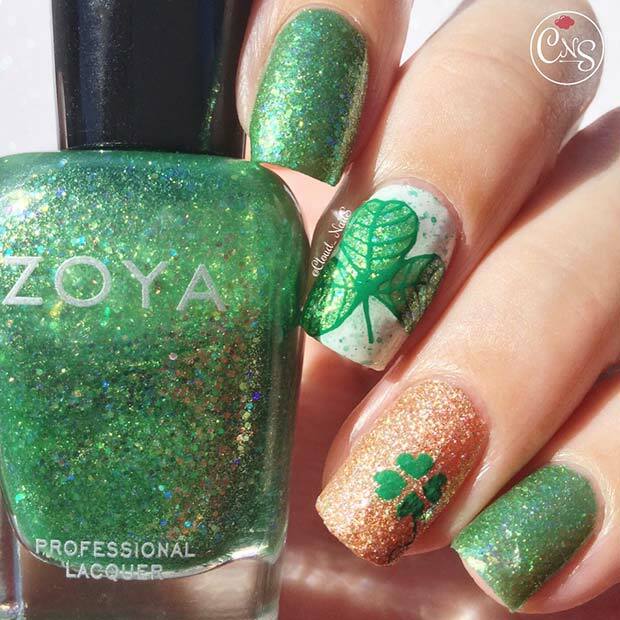 We love this accent nail because it features green shamrocks and glittery ones, the combination is super cute! You could recreate this look as an accent nail or paint all your nails with the design. Last on our list is this pretty pink St Patrick’s nail design. Some nails are painted in green glitter, one is pink with a green shamrock and there is also a polka dot nail. This idea is perfect for anyone who wants a vibrant and fun manicure for the celebrations. You could recreate a similar look with a different color to instead of pink. We hope you have been inspired by our St Patrick’s day nails!